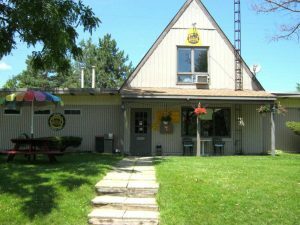 Post 124: Camper's Corner, London, On - A Snails Life and Lovin' it! Our last leg of the trip Home. We had planned only going about 3 hrs and staying in Windsor, On. Once we crossed over the USA/Canadian Border, it was only 3:00 pm. We thought what the heck, we were only 2 hours from Camper’s Corner in London, where we planed on spending a week. Lets keep on going and settle in for the week. This made for an 8 hour really windy, rainy, stressful day. But, when you saw a light at the end of the tunnel, lol it was worth the extra 2 hours. Backing up a bit to the trip across the border. When we arrived at the USA/Canadian Border, there was a bit of a line up. We waited for maybe 20 mins before we pulled up in front of a female Custom Officer. Joy did her usual thing with the girls and handed them a huge dog cookie before we stopped to chat with the Officer. When we stopped, the first question was, what is your truck’s lic number. Wow we never remember this, Joy used to have a pic of it on her phone, but she broke her phone back in New Mexico when she dropped it. Poor Bill quickly hopped out of the truck to go look at the plate. Joy remembered it was on the registration in the glove compartment at the same time, but it was too late for Bill at that point. Getting that question answered finally lol, the next few questions were, how long have you been away, how much did you spend, what are you bringing back. Bill quickly answered with a smile. Next we know, the lady who had looked not so happy when we pulled up, handed us back our pass ports and wished us a good day. Wow, 3 mins tops and we were on our way again! Awesome! Joy doesn’t even think the dogs had finished their cookies yet. The next problem was getting to the highway without getting taken out by all the 18 wheelers who were also clearing customs to our right. Wow there is really something wrong with that system of clearing customs with cars and trucks in this location lol. Back in Canada, we found most of the lights in Windsor were swinging dangerously and were blinking red. They had all become 4 way stop signs. The high winds had taken out the power in Windsor. We just followed an 18 Wheeler up the highway and crossed intersections when he did. What better protection from cross traffic than that lol? Back on the 401, we realized that our T-Mobile phone which we were told would work in Canada seemed to be working really well. We have 4G and/or lite internet with an R(Restricted) beside it. “Ruh-roh!” as Scooby Doo says.. this can’t be good. Eventually we received an email from T-Mobile with information telling us all was well and we were covered the same way as we were in the USA. Phew!! Now we just had to wait and see if T-Mobile worked in Bainsville, where we would be camping all summer. If that wored then we didn’t have to worry about finding a new internet provider for the summer Yay. Currently we were sitting in London with 4G for internet using our T-Mobile phone hotspot.